Mix a light application of a balanced organic fertilizer into the soil before planting. Beans, Strawberry, Parsnip, Nigella and Beet. 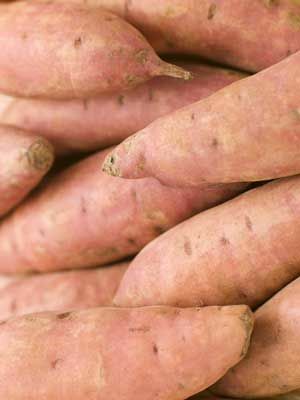 Sweet potatoes form a dense green ground cover under hot summer conditions. Tubers are often found 12 inches or more from the plant's primary crown, so dig carefully. Although not from the solanaceae family, sweet potatoes are often placed in that group for crop rotation purposes because they share several important pests and diseases such as wireworms and nematodes which is why we show it as solanaceae. Dig in fall when the soil is still warm. Cure in a warm, airy place for two weeks before storing at cool room temperatures.